Parallel titles and other title information: Title based on provided annotations. 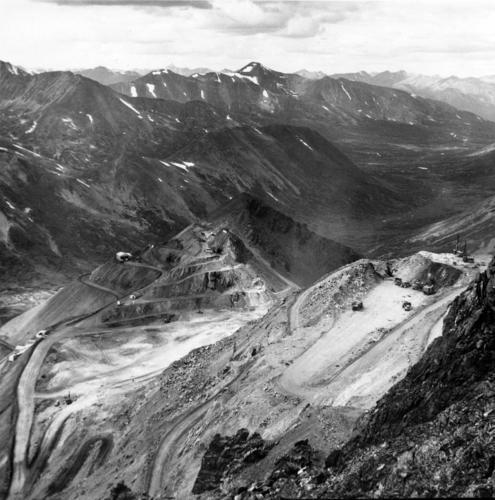 Photograph depicts mine area at Cassiar, crushing plant visible on left. Various mine buildings visible midground. Blasthole drills, shovels, dozers, and dump trucks can be seen on bench in foreground at 6430 elevation. Handwritten annotations on recto of photograph: "6"; "View looking NW from top of S. peak 6790 elev. on 6430 stripping bench on it and 6050 ore bench further down on left. "; "July 1961". Item is part of the Cassiar Asbestos Corporation Ltd. fonds. Item is one of 32, see also items 2000.1.1.3.19.2 - 2000.1.1.3.19.32.